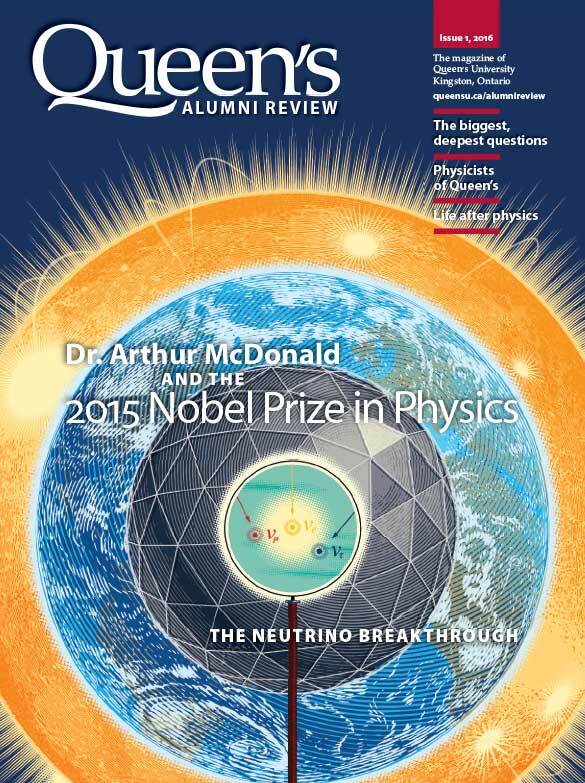 A study of solar neutrinos is only the first step in the development of the new field of neutrino astronomy. We’re not limited to looking only at neutrinos coming from our own sun. Who knows what we will find? Before the neutrino detector was ever put into operation, George Ewan and his colleagues from Queen’s and other universities spent years on research, excavation, construction, collaboration, negotiation and trouble-shooting at the Sudbury mine site, often while juggling teaching and other duties at their home universities. In January, members of the original SNO Collaboration got together for coffee in the graduate lounge in Stirling Hall. Dr. Robertson did research in double beta decay that would prove valuable to the SNOmproject. Dr. Evans worked closely with the INCO engineering team. Dr. Mak, part of SNO from the start, developed the specifications for the photo multipliers used in the detector. Dr. Leslie, formerly the principal investigator for the Queen’s Van de Graaff accelerator group, joined the SNO team in 1986. Dr. Skensved worked on data analysis for SNO: he continues working at SNOLAB, focusing on the SNO+ and DEAP projects. The others are all emeritus professors. On this day, they were back in Stirling Hall to sit in on a SNOLAB update given by current researchers and students. A number of the group (including Art McDonald and Bill McLatchie, both of whom were out of the country at the time of the photoshoot) also have a standing weekly physicists’ lunch date at a downtown Kingston restaurant. I remember being down at the bottom of the mine when we finished the excavation and looking up. It was like being in a cathedral. Dr. Ewan, co-founder of SNO, was also active in data analysis and detector calibration, as well as securing funding for the lab and its research. It was tough. I remember being sent down to the 6000 level of the mine to explore the drift. The rock temperature was 40 C!